Let’s build the process to automate the database refresh activity using a simple backup-and-restore method and scheduling it using SQL Server Agent. Let’s take a closer look at the process to see how this works. First, create a new database, ProdSQLShackDemo, and a table, SQLShackAuthor. Let’s go ahead and populate the SQLShackauthor table with some records. Now, back this up to a desired location; in this case it’s F:\PowerSQL\. Let’s name this full backup as ProdSQLShackDemo.BAK. The backup database command is used with the FORMAT clause. The format option overwrites any existing backups and creates a new backup set. The RESTORE FILELISTONLY SQL requires a path to the backup file. This will return a table with corresponding logical and physical records of each file inside of the backup. In this section, we will see how to restore the database with a different name: TestSQLShackDemo. Use the F:\PowerSQL\ProdSQLShackDemo.bak as a reference backup file. The MOVE clause is used to move the files to a different file location. The keyword RECOVERY is used, since we don’t have any further backups to restore. We can see that the new TestSQLShackDemo has been created. To verify the restoration process, select everything out of these two tables. Restore the database to a different server. This is to simulate the real time scenario: we back up the production database and restore it to the test environment. We use SQLCMD for the proof of concept. Let’s now go ahead and automate this process. Use the robocopy utility for the copy operation. This way we quickly transfer data across the network. Before restoring, check the existence of the target database, and then use the alter database statement to set the target database to single user mode; issue a drop database command to drop the target database. In the first run, the target database was created for the first time. You can check the create_date column to confirm. In the first result set we can see the absence of the target database. The result is empty. In the second result, the database was created. In the second run, though, the database exists at the target SQL instance (because of the first run). Therefore, the target database is dropped and recreated during this run. Notice the create_date column; the first highlight is after the first run. In the second highlight, we see that ProdSQLShackDemo’s create_date is different, which shows that the database was dropped and created again. To test that sqlcmd is working, execute the SQL Script file from the command prompt. 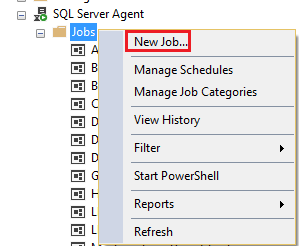 Create a new job on the SQL server agent. Browse object explorer, expand the SQL Server agent folder. In the general properties, enter the name of the job. Let’s call it BackupandRestoreAutomation. In the command option, type the command that we want to execute; in this case it’s the sqlcmd command that invokes the script file using the –i option. The name of the schedule is BackupAndRestoreSchedule. Choose the frequency and best time to run the job as per your requirements. The job is now created. This takes care of the automated backup and restore of the databases. Using SQLCMD with the source and target being on the same instance on the same server. Using SQLCMD and SQL Server Agent, wherein the source and the target were on different machines. We used the ROBOCOPY utility to perform the database backup file transfer. That’s all for now. Stay tuned for more on SQL Server backups! What is backup and restore in SQL Server disaster recovery?